Jake Clarke has had a love for all dog breeds but has a huge passion for rescue dogs and bull breeds in particular. Jake currently owns seven rescued bull terriers that have all made significant progress under his wing. Jake has spent the last ten years volunteering and working in a variety of rescue centres. 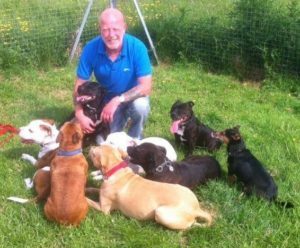 He has handled and worked with a variety of dogs with a varying degree of behavioural issues including dog on dog aggression, dog on human aggression, separation anxiety and recall issues to name a few. Jake has taken numerous courses with The Cambridge Institue of Dog Behaviour and Training to continue his professional development. Jake is also a member of The Guild of Dog Trainers. Jake is also a full member of The Canine and Feline Behavioural Association. Jakes goal is to help improve dog and owner communication and understanding. He focuses on reward-based training as a foundation to build confidence, trust and a healthy bond with your dog. To contact Jake please complete the contact form and Jake will be in touch really soon..
All content, images and video on our web site, social media pages and on printed materials are protected by United Kingdom copyright law and may not be reproduced, distributed, transmitted, displayed, published or broadcast without the prior written permission of Cwnsaethu dog behaviour and training, Rebelritsi photography, Rebelritsi Gundogs, James Reavil and Hannah Spearman. Copyright © 2019 Cwnsaethu Dog Behaviour and Training. All rights reserved.